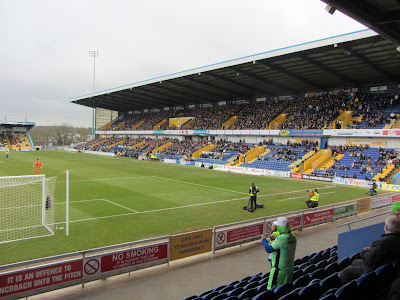 My third ground of 2018 was on Saturday 10th March at Field Mill in Mansfield, Nottinghamshire. The match was Mansfield Town vs. Colchester United in Football League Two. Field Mill is in the south of Mansfield less than a mile from the town centre. The stadium complex is mostly bordered by a retail park though half of the eastern side has housing running up to it. As part of the site there is an additional full-size pitch and couple of mini pitches adjacent to the west stand. The venue is half a mile south of the town's railway station and though it has been home to the club since they 1920 it is known that football has been played at the ground since at least 1861 making it the oldest in the Football League. Field Mill was extensively renovated in the late 1990s/early 2000s with three of the four sides up to a modern standard. 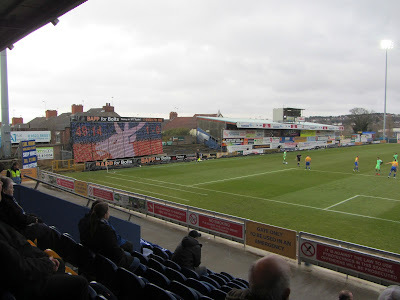 The stadium is dominated by the West Stand which renamed the Ian Greaves Stand in 2010. This two-tier structure has a capacity of 5,500 and is the most popular amongst home fans. The tiers are similar in nature with the only exceptions being a media section separated off in the top tier and a couple of areas for disabled fans in the lower tier. The club's hospitality boxes are located at the back of the bottom tier while the bottom of the stand also hosts the Sandy Pate Sports Bar as well as a merchandise outlet outside the building leading into the car park. The other two stands in use are behind the goals and look near-identical. These both have a capacity of just under 2,000 with the northern end given over to away fans. 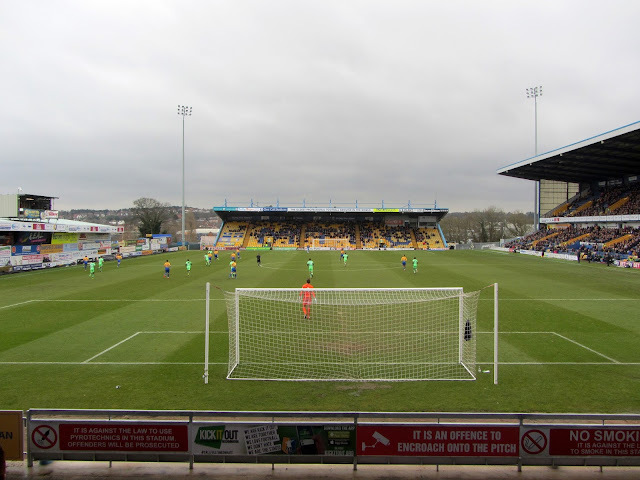 The obvious differences are that the southern end has a police box in the top-west corner and sitting next to the stand is the players tunnel which leads from a changing room building at the back of the stand. The eastern side of the ground is currently unused. The Bishop Street Stand is largely an uncovered concrete terrace with an all-seater stand built atop the terracing in the middle. This stand is boarded up with advertising hoardings and has been closed for a few years due to safety concerns. Its current use is for a TV gantry to sit atop it to film the matches. There is a very large LED screen in the northern corner displaying the score and any relevant information the club wish to broadcast. The first part of the game saw a couple of wayward efforts from the visitors through Brennan Dickinson and Drey Wright. The hosts then had a good spell in the middle of the half and took the lead in the 22nd minute. It was a route one goal with Conrad Logan's long goal kick bouncing thirty yards from goal and as Colchester keeper Sam Walker and defender Tom Eastman waited for each other to react Kane Hemmings nipped in to lob the ball into the net. This poor goal was the catalyst for a 10 minute spell where Mansfield laid into a rattled Colchester. Danny Rose's volleyed effort went close and the U's displayed some dire passing that really should have been punished by the hosts. The visitors had their best chance on the stroke of half-time as Sammie Szmodics through ball unleashed Kurtis Guthrie and his effort was heading in until covering defender Malvind Benning cleared off the line. The decent end to the half for Colchester continued into the second period and the equaliser came in the 50th minute. Brandon Comley picked up the ball on the right-hand side before heading into the area, fending off a challenge and striking across goal into the bottom corner from 10 yards out. The rest of the second half was an entertaining one with Colchester having the upper hand though either side could've won it. Paul Digby's looping header in the 69th minute came back off the Colchester crossbar while a great double save by Sam Walker just before time denied Malvind Benning first and then Jacob Mellis on the follow-up. 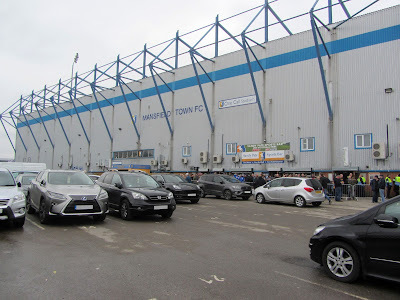 Meanwhile at the other end the visitors had a succession of corners and shots on goal that could've seen Colchester pick up all three points on another day.